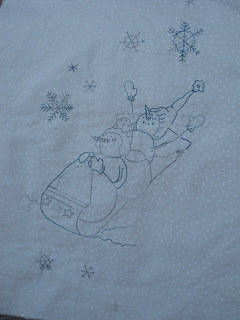 I have another block completed for the Winter Wonderland Crabapple Hill quilt... I know I am not going slowly - I am crawling with this one - but I guess it is a labor of love, right? At this pace, this quilt will take a few years to finish!!! My friend Celeste finished hers in one year, Roxanne in three. Anywhere in between will suit me fine. Traditionally, monochromatic embroidery work is done in red, blue, green or black. Mrs. Non-Traditional here decided to use variegated thread ranging from blue to grey. My sister said that she would have definitely chosen red. Oh, well. I am sure my boys will like the blocks. In fact, I am soooo tempted to turn these blocks into wall hangings! This way, instead of fighting over one quilt when I croak, they each can have their own wall hanging. What do you think? I really like your embroidery, and the idea of using a non traditional thread colour. I like the variegated threads. They prevent the dreaded one colour overload. LOL!! 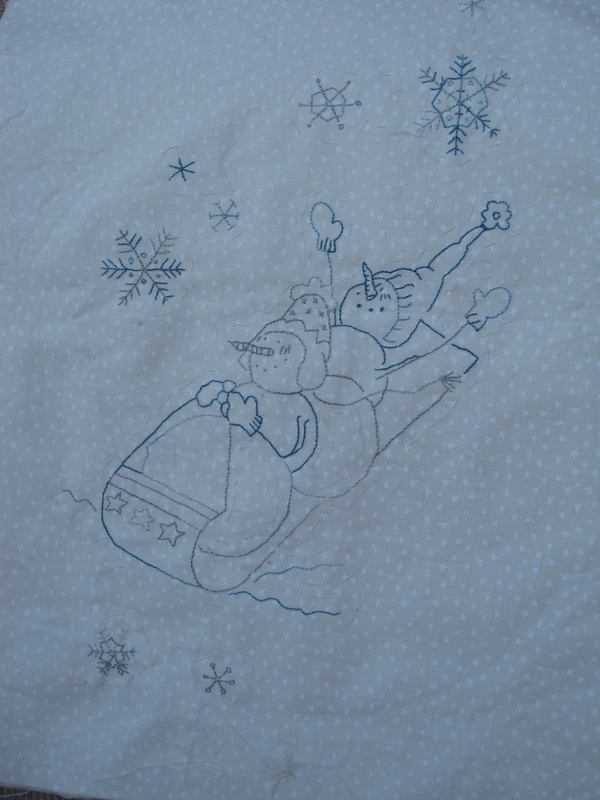 Denise, that embroidery of the snowmen scene is adorable ! You're doing a wonderful job, and we're looking forward to seeing more blocks of "Winder Wonderland." The blue/grey veregated sounds intriging, can you please tell me what brand and color number it is and are you using floss or pearl cotton ( my favorite thread).